Some music is best appreciated in a comfy chair with a pair of headphones and uninterrupted concentration and contemplation. Some fare better on a rainy day, soundtracking your melancholy as though your life is a film and you are the star. Not Ozomatli though. 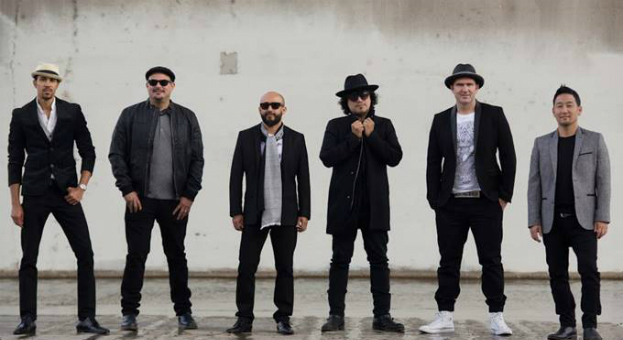 Ozomatli are best enjoyed loud, on stage and with your inhibitions left at the door. The Los Angeles latin hip hop fusion have been entertaining audiences worldwide for over 20 years now. They’re the sort of band that you never forget seeing, bringing energy levels and enthusiasm to Hillsong levels, but without the brainwashing. Any concerns I had that this music would not translate to a Sunday night in Brisbane were relieved when the band stormed the stage to a frenzied rendition of Paleta. It’s the perfect example of a song that works so much better live than on your car stereo stuck in a sea of traffic. Its soca-fused attitude is all about dancing like you just don’t care, its positivity being borderline cartoonish. Ozomatli were never more popular than early in their career back when they were frequent Jurassic 5 collaborators with thousands of mislabelled versions of Cut Chemist Suite being shared on LimeWire. Their debut album was just too good for them to ever hope to top it. Their medley of older tracks in the middle of the set was a nice way of appeasing those who were just there for the hits, but can’t be recreated faithfully since DJ Spinobi left the band in 2006. When the band kicked into Cumbia De Los Muertos it was like welcoming an old friend. Unfortunately, the same couldn’t be said for the section of the set dedicated to their newer more straight up reggae tracks, highlighting some of the lazier aspects of the band’s music when they voyage into a genre straight-faced. Part of the reason Ozomatli are such a joy to behold live is their genuine enthusiasm for what they’re doing. The drummer struggled to keep the smile from his face for the entire night as his bandmates worked up the audience. It was as though it was the first time he’d seen them do what they do. Asdrubal Sierra, Ulises Bella and Justin ‘El Niño’ Porée in particular got the crowd going, requesting clap-alongs and arm waving like we were at some sort of aerobics class. Standing in the corner to catch up on some beard stroking was not an option. The supports for the night couldn’t have been better picked, both Electrik Lemonade and True Vibenation sharing the same charismatic performance styles, flitting through genres as though there’s a reward for how many you cover. They joined the band on stage for Como Vesm, the last song played on stage that night. It was genuinely touching, the members of True Vibenation in particular looking starstruck as Ulises Bella instructed each member to start soloing. As the song drew to its conclusion, the band began to collect their instruments for the inevitable rhythmic conga line which has been closing out their shows for a number of years now. Justin ‘El Niño’ Porée pounded his drum and blew his whistle with enough gusto to almost make you forget where you were. Ozomatli may never be as popular as they once were, but as long as they keep playing live the way they do there’ll always be people who will come out to see them. Their latest album was successfully crowdfunded through Pledgemusic, showing they still have a strong fanbase willing them to continue doing what they’re doing. This is not a band for the headphones, your opinion of their music is moot until you’ve seen them doing what they do best. When they say “Ozo”, I recommend you say “Matli”!